Author: Subject: Synthesis of 3-(p-Hydroxyphenyl)-2-Butanone "raspberry ketone"
Synthesis of 3-(p-Hydroxyphenyl)-2-Butanone "raspberry ketone"
As a weekend distraction, I'm thinking of trying to synthesise this flavor at home. 1°- Enolate synthesis: Forming the enolate of MEK with NaOMe, and reacting it with a protected p-halophenol. The phenol would react with the methoxide, and could/would form an ester. I'm not sure on what to use for a protection, maybe reacting the phenolate with BnX or forming another ether..
From the information available, using DMF as a solvant for the alkylation, and either FeSO4 or UV as catalyst. I'm not sure how well the reaction would proceed. 2°- Acetoacetic ester synth of the protected bromophenol, followed by alkylation with MeI of the formed ester with another equivalent of alkoxide at the benzylic carbon, followed by hydrolysis/decarboxylation. Then of course deprotection of the formed ketone. Would the clivage of an ether with a Lewis acid damadge the ketone? Any advice, ideas, suggestions? Any other ideas of pathways would be welcome. Among the hydroxybenzaldehydes, only mono-, di- and trihydroxybenzaldehydes are known. Salicylaldehyde (2-hydroxybenzaldehyde) and 4-hydroxybenzaldehyde represent more than 99% of the hydroxybenzaldehydes' market. The physical and chemical properties of hydroxybenzaldehydes are described. 2-Hydroxy and 4-hydroxybenzaldehydes react in a similar manner as phenol toward electrophiles. The aldehyde function can be reduced or oxidized to form a variety of compounds depending on the reagents and conditions used. Hydroxybenzaldehydes undergo the normal reactions of aromatic aldehydes. Most industrial methods for the manufacture of hydroxybenzaldehydes are based on phenol, but other routes exist, starting from hydroxybenzoic acids, by reduction, or from cresols, by oxidation. Both p-hydroxybenzaldehyde and salicylaldehyde have a low to moderate acute oral toxicity, but salicylaldehyde is, in addition, corrosive toward skin and appreciably irritating to the eyes. The hydroxybenzaldehydes are used primarily as chemical intermediates to a variety of products. The largest single use of salicylaldehyde is in the manufacture of coumarin. Both are used as intermediates in the synthesis of agrochemicals, pharmaceuticals, fragrances, and in electroplating. 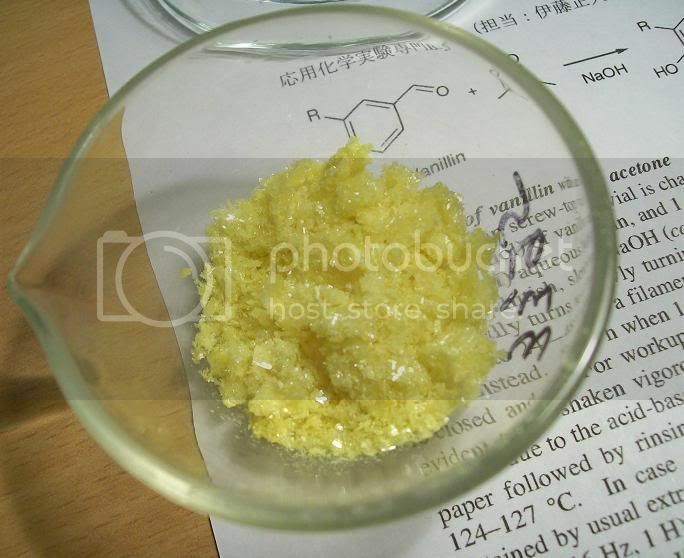 Condensation products of salicylaldehyde and diamines have important chelation properties, and have wide use in the stabilization of petroleum products, and in chemical processing, especially as oxidation catalysts. These and other applications to polymer chemistry are described. Bunce, R.A., and Reeves, H.D. 1989. Synth. Comm. 19:1109-1118. Tateiwa, J.-I., Horiuchi, H., Hashimoto, K., Yamauchi, T., and Uemura, S. 1994. Cation-exchanged montmorillonite-catalyzed facile Friedel-crafts alkylation of hydroxy and methoxy aromatics with 4-hydroxybutan-2-one to produce raspberry ketone and some pharmaceutically active compounds. J. Org. Chem. 59:5901-5904. Halogen isn't going to come off the phenol very easily. This sounds more like the palladium catalysed reactions, you might even be able to get MVK to couple with the halo-phenol, the reduce the alkene which should happen easily as it's a,b to the keto. Raspberry ketone (p-hydroxyphenyl-2-butanone) is a key flavour molecule with typical raspberry flavour characteristics and a low odour threshold. Raspberry ketone is one of the most expensive flavour components used in the food industry. Up to $20,000/kg may be paid for the natural compound. Raspberry ketone can be found in raspberries and other fruits (such as peaches, grapes, apples and various berries), vegetables (e.g. rhubarb) and in the bark of tree (e.g. yew, maple and pine). Raspberry ketone can be used in the aroma formulation of, for instance, strawberry, kiwi, cherry and other berries. However none of these fruits are used to obtain the raspberry ketone as the low content of raspberry ketone in these fruits makes the extraction and purification process unprofitable. Raspberry ketone can be produced chemically via the condensation of p hydroxybenzaldehyde with acetone. However, the chemical synthesis of compounds can often result in environmentally unfriendly production processes and in undesirable racemic mixture of the compound of interest (Vandamme and Soetaert 2002; J Chem Techno Biotechnol 77:1323-1332). In raspberries, the synthesis of raspberry ketone is one part of the phenylpropanod pathway. This pathway has been described by Borejszaysocki and Hrazdina (1994). In the first step, coumaryl CoA (which Is present In many plant tissues) is condensed with one malonyl CoA into benzalacetone (p-hydroxyphenylbut 3-enc-2-one). The enzyme catalysing this step is called benzalacetone synthase (BAS). In the second step, the double bond in benzalacetone is reduced, resulting in raspberry ketone (p-hydroxyphenyl-2-butanone). The enzyme catalysing this step is called benzalacetone reductase (BAR), this enzyme requires the presence of NADPH. Benzalacetone synthase (BAS), EC 2.3.1.-., is a member of the polyketide synthase family. Benzalacetone reductase condenses one acetone unit from malonyl CoA with one p-coumaric acid to form benzalacetone. Chalcone synthase (CHS), EC 2.3.1.74, is another member of the polyketide synthase family, which condenses three acetate units from malonyl CoA with one p-coumaric acid to form chalcone. Stilbene synthase (STS), EC 2.3.1.146, is another member of the polyketide synthase family, which condenses three acetate units from malonyl CoA with one p-coumaric acid to form stilbene (Zheng et al 2001). The polyketide synthase family is described in detail in Schroder 1999 (Comprehensive natural products chemistry vol 1: polyketides and other secondary metabolites includingfatty acids and their derivatives [U. Sankawa Ed] pp 749-771). CHS is part of another part of the phenylpropanod pathway, which converts phenylalanine into naringenin chalcone and its derivatives (Weisshaar and Jenkins 1998; Hwang et al 2003). This part of the phenylpropanoid pathway involves the following enzymes: phenylalanne ammonia Iyase (PAL), cinnamate-4-hydroxylase (C4H), 4-coumarate:coenzyme A ligase (4CL) and chalcone synthase (CHS). As a first step phenylalanine Is deamnated to yield cinnamic acid by the action of PAL. Cinnamic acid is hydroxylatcd by C4H to 4-coumaric acid. 4-coumaric acid is activated to 4-coumaryl-coenzymeA (CoA) by the action of 4CL. CHS catalyses the stepwise condensation of three acetate units from malonylCoA with 4-coumaryl CoA to yield nanngenin chalcone (which is a precursor for some flavonoids). Naringenin chalcone is converted to naringenin by chalcone isomerase (CHI) or naringemn chalcone spontaneously converts to naringenn. Evidence for the relation between BAS and CHS is provided by BorejszaWysocki and Hrazdna (1994 and 1996). Borejsza-Wysocki and Hrazdina (1994) show that the timing of BAS activity parallels CHS activity. In addition, Borejsza-Wysock and Hrazdina (1996) show that CHS and BAS co-purify, and seem to react with the same antisera. However, CHS and BAS activity in the same enzyme preparation showed a different response to treatments with, for instance, 2-mercaptoethanol and ethylene glycol. Also, CHS activity and BAS activity showed different induction patterns upon treatment of raspberry cell cultures with yeast extract, suggesting that these enzymes are not one and the same molecule. cholestenone 5 alpha-reductase etc. for which genes are known. However, none of these enzymes was reported to have benzalacetone reductase (BAR) activity. It is known from literature that 4-hydroxybenzalacetone can be transformed to raspberry ketone by fungi or yeasts such as Pichia, Saccharomyces, Beauveria, Kloeckera, Aureobasidium, Cladosporium Geotrichum, Mucor and Candida spp. (Fuganti and Zucchi, 1998). However, no gene has been identified in connection to this enzymatic activity. Also, to our knowledge, no such activity has been reported for bacteria, neither gram negative nor gram positive. pp 269-273) teach a biotechnological method for producing raspberry ketone. This method comprises culturing a microorganism which has a secondary alcoholdehydrogenase (ADH), such as Candida boidinii, and adding the precursor betulosde to the culture medium. In this cellular environment the secondary ADH dehydrogenatates betuligenol into raspberry ketone. Various studies have been carried out to determine the role of polyketide synthase genes in the production of flavonoids using E cold transformed with a raspberry CHS gene (see Zheng et al 2001; Kumar and Ellis 2003), a Glycyrrhiza echinata CHS gene (Hwang et al, 2003) or a Arabidopsis thaliana CHS gene (Watts et al 2004). However these studies teach the in vitro or in vivo synthesis of naringenin. These studies do not teach the in vivo synthesis of benzalacetone or raspberry ketone. Abe et al (2001) teach the cloning of rhubarb BAS, expression of the gene in E colt, purification of the recombinant BAS protein and the in vitro synthesis of benzalacetone. However this study does not teach the in vivo synthesis of benzalacetone or raspberry ketone. According to a first aspect of the present invention, we provide a host cell comprising a chalcone synthase (CHS) polypeptide sequence and a 4coumarate:CoA 1igase (4CL) sequence in which one or both of the CHS polypeptide sequence and the 4CL sequence is heterologous to thc host cell. Preferably, the CHS polypeptide sequence is derived from one of the following: raspberry, petunia, grape, Medicago sativa, Arabidopsis thaliana, Antirrhinum majus, Zea mais and Petroselinum crispum, preferably a raspberry CHS sequence. Preferably, the CHS sequence is selected from the group consisting of: accession number AF292367, accession number AF400567, accession number X04080, accession number X76892, accession number L02902, accession number AF112086, accession number X0371O, accession number X60204, accession number V01538, a sequence shown in SEQ ID NO: 2, and a sequence having at least 75% sequence homology thereto. Preferably, the 4CL sequence is a tobacco 4CL sequence. Preferably, the 4CL sequence is a sequence having an accession number U50846 or a sequence shown in SEQ ID NO: 3. Preferably, the host cell is transformed with an expression vector encoding the chalcone synthase (CHS) polypeptide sequence and an expression vector encoding the 4-coumarate:CoA ligase (4CL) sequence, or an expression vector encoding both sequences. Preferably, the host cell is a microbial host cell selected from the group consisting of F,scherichia spp, Saccharomyces spp, Pichia spp, Beauveria spp, Candida spp, Aspergillus spp, Bacillus spp, Pseudomonas spp, Hansenula spp, Klayveromyces spp, Schizosaccharomyces spp, Streptomyces spp, Lactococcus spp, Lactobacillus spp, Pediococcus spp, Kloeckera spp, Aureobasidium spp, and Streptococcus spp, preferably an E. colt, preferably strain BL21, or a Saccharomyces cerevisiae, preferably strain YPH 499, or a Bacillus subtilis host cell. Preferably, a polypeptide expressed from the CHS polypeptide sequence has benzal acetone synthase (B AS) acti vity. Preferably, the host cell is capable of producing benzalacetone when supplied with a precursor of benzalacetone, preferably p-coumaric acid or a source of p coumarc acid. Preferably, the host cell has benzalacetone reductase (BAR) activity, preferably inherent benzalacetone reductase (BAR) activity. Preferably, the host cell further comprises a benzalacetone reductase (BAR) sequence, preferably a heterologous BAR sequence, preferably shown as SEQ ID NO: 5. Preferably, the host cell is capable of producing raspberry ketone when supplied with a precursor of raspberry ketone, preferably benzalacetone or a source of benzalacetone. Preferably, the host cell is capable of producing raspberry ketone when supplied with a precursor of raspberry ketone, preferably p-coumaric acid or a source of p-coumaric acid. Preferably, the host cell further comprises a cinnamate-4-hydroxylase (C4H) sequence. Preferably, the host cell Is capable of producing benzalacetone or raspberry ketone, or both, when supplied with cinnamic acid or a source of cinnamic acid. Cation-exchanged montmorillonite-catalyzed facile Friedel-crafts alkylation of hydroxy and methoxy aromatics with 4-hydroxybutan-2-one to produce raspberry ketone and some pharmaceutically active compounds. Tateiwa, J.-I., Horiuchi, H., Hashimoto, K., Yamauchi, T., and Uemura, S.
were the most effective catalysts in these cases (13-58% isolated yield). y-KB could be used as an alkylating agent instead of the highly toxic 3-buten-2-one (MVK) which also polymerizes easily. Amberlyst-15 has been used to catalyze regioselective additions of phenols to agr,b.beta-unsaturated ketones in yields of 20-90%. The reaction is superior to the analogous reaction employing concentrated sulfuric acid in affording greater yields and purer products with a minimum of laboratory operations. Thanks for all thoses articles! But in all the articles/patents you guys have kindly provided, it is said to be the straight-chained isomer. To my eyes, the linear isomer 4-(para-hydroxyphenyl)butanone seems easier to synth, especially through the p-hydroxybenzaldehyde pathways. A crossed aldol with acetone is easy and well documented, basic conditions would be more effective here I guess, the benzalacetone should be easy to isolate and purify, and I guess a CTH could reduce the double bond, or NaBH4 even if the carbonyl gets reduced, it could easily be re-oxydized. US4414417 deals with a CTH using Rhodium and Iridium catalysts that yield the saturated ketone; this could be applied to other catalyst/donors. The FC option seems equally interesting, but not possessing any b-hydroxybutanone, it doesn't seem readily obtained from MEK or other accesible reagents. p-hydroxybenzaldehyde could be obtained through a Riemmer-Tiemann as mentionned in the review Solo provided, I remember ready about performing the reaction in alcoholic medium to preveil the para-formylation. I have ~30g of phenol left, so this could be enough on a small scale, though I want to give the o-formylation a try using Mg(OCH3)2/paraformaldehyde a try again. Maybe a bayer-villiger oxydation on benzaldehyde could give workable yields of phenol. I don't want to melt any benzenesulfonic acid with NaOH . Well, I guess I'm going to keep busy for a while thanks for the help! I reckon I could even practice the yeast reduction on the zingerone - although that rhodium catalyst makes ones mouth water eh? target compounds and the synthetic methods used, along with experimental procedures and IR and NMR data on the compounds encountered. Thanks alot for those two last papers, especially your Solo, just what I need. I think i will ratehr try a NaBH4 reduction of the unsaturated ketone though, as I don't plan on aquiring any rhodium catalyst, and Pd/C would surely give the same result as NaBH4, or a mixture of the saturated alcohol and ketone. I might try it with some recylced catalyst at a small scale, as per Solo's document. I will surely try making zingerone first, trying the aldol condensation and see how the reduction goes, I've encountered a few mishabs with the Mg(OMe)2 / (H2CO)n formylation, although the reaction seems to proceed well. Left the acidifyed mixture stir too long, resulting in a f**king polymeric sludge (excess paraformaldehdye). It's just a lot of work, along with the preparation and drying of the reagents. Does seem more interesting than the Riemmer Tiemann though. Thanks also to solo for the last paper... Also thanks for pointing out 'The Chemical Educator', a journal that I wasn't aware of. Perhaps this is akin to the Journal of Chemical Education(?) which I like a lot. Klute - Let us know how the NaBH4 reduction goes, that would be easier for me to try then the hydrogenation. klute: Pd/C-CTH does generally NOT reduce carbonyl functions. 30. Mannich, C.; Merz, K. W. Archiv d. Pharm. 1927, 265, 15. 36. Pabst, A.; Barron, D.; Adda, J.; Schreiber, P. Phytochemistry 1990, 29, 3853. 47. Banno, K.; Mukaiyama, T. Bull. Chem. Soc. Japan 1976, 49, 1453." I might try a microscale experiment with recycled Pd/C, both by CTH and catalytic hydrogenation as per the article, if I have enough time. But if NaBH4 reduction works as cleanly and effeciently as I hope it will, and oxydation with either H2O2/Fe3+ or some HOCl source works nicely, it could come out cheaper/more practical than getting some Rh/Alumina, of which I won't have any immediate use elsewhere. -the saturated alcohol, by doing a two-step one-pot procedure, first reducing the carbonyl then the double bond, or vice versa. So this really is a key article for this synth, no need of catalytic hydrogenations, or multiple steps to obtain the ketone. Aldol, reduction, voilà. Mild conditions, easy workup. I will try out the zingerone synthesis as soon as I get my vanillin, and then start working on get that para-hydroxybenzaldehyde... Any ideas apart from the Riemmer Tiemann, which isn't really para-selective, and would yield o mixture of o- and p-isomers? BTW, NiCl2 can be used aswell with similar results. I will also report back on the Mg(OMe)2/(CH2O)n formylation once everything is done. EDIT: I read the wrong colum in the tables, actually the best yield of the 1-phenylbutan-3-one is 86%, when using a solution of Sodium Dodecylsulfate.. I don't know about purity, but to get some vanillin on the cheap, go buy the cheapest bottle of clear artificial vanilla extract that you can (essentially containing vanillin, ethanol, and water) and place it in a flask with air excluded (such as by a piece of aluminum foil with a small hole in it) and heat until ethanol stops boiling off (I did this a looooong time ago before I had much experience or a decent thermometer and remember that the solution suddenly changed boiling pattern when this happens..I was also checking the flammability of the vapors). You may have a second phase seperate. 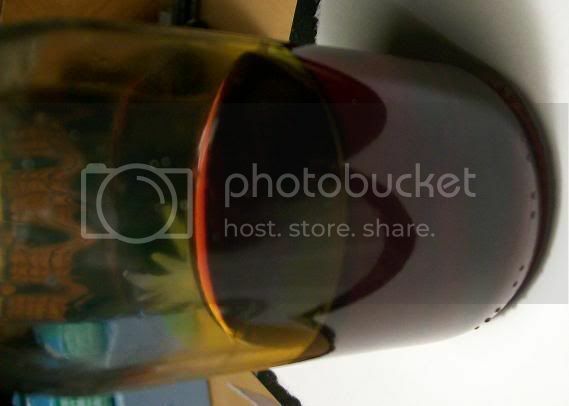 This is liquid vanillin or perhaps liquid vanillin with water dissolved in it (mp. vanillin 81-83C). Add water and heat to dissolve if this occurs. Chill the solution (which may be a pale amber color from oxidation/polymerization products. Using aluminum foil and allowing water/alcohol vapor to form a protective atmosphere minimizes this) Vanillin crystallizes out as long, thin, pale yellow/cream colored needles. I got 13g from an 8oz bottle ($7 US) I'm sure most here can improve on this method though. pathway being, therefore, the one carried out by H2." I guess the product is contaminated by saturated alcohol, and that the 2 must be hard to seperate. A light oxydation could convert any over-reduced material back to the ketone, but could also make more impurities, and give a complex mixture of products. Let's try it one pot. So if the benzalkonium (pool supply) doesn't work out nicely, I was thinking about generating before-hand the metal boride with stoechimetric amounts of borohydride and the chloride, in the appropriate solvant, and then adding the substrate and performing a atmospheric catalytic hydrogenation. Wouldn't it basicly proceed the same way as in-situ formed H2? I think it is molecular hydrogen that is evolved and not nascent, but don't take my word on this. Can anyone can help me out here? This way, no need of using expensive Rhodium catalyst. EDIT:I've been kindly given ~30g of reagent-grade vanillin, so I will be able to perform the aldol condensation this weekend. I've decided on trying a simple atmospheric catalytic hydrogenation with preformed CoB catlyst (from CoCl2 and stoechiometric NaBH4), as I've realized I've only got a couple grams of CoCl2 and no NiCl2... We will see how it turns out. I'm still undecided concerning the amount of catalyst to use... Any advice would be welcome. This deals with the use of colloidal NiB catalyst, mixed with rare earth oxides in some cases, to afford a highly active catalyst, prepared from the metal salt, and alcoholic NaBH4 in presence of PEG. The hydrogenation of p-hydroxyphenylbut-3-en-2-one to Rheosmin "raspberry ketone" is covered. The preperation of the "simple" catalyt is straight forward. They claim a 96% isolated yield of rheosmin when using Ni2B, in 170min, and the hydrogen uptake rate and thus reaction is much quicker when the catalyst is made as described with PEG and Nd2O3. Another particluary interesting thing is that they compared the activity of this catalyst with Pd/C, and claim a 96% isolated yield of Rheosmin in 160min! This is pretty contradictory with the Chem.Educ. article. At first reflexion, I would rather trust the Chem. Educ. article, as the reactions were reviewed for use in academic labs by students, although it is not explicity claimed that the Pd/C hydrogenation was. But then again, when presenting a new catalyst, the authors of the Cat. Today would have highlighted the strong superiority of their catalyst towards product isolation if they had obtained bad yields when using Pd/C. Although dishonest, claiming higher yields with the object of their article would seem more logical than claiming high yields (although longer reaction times) with such a widely used catalyst. In any case, this inspires me at trying it. The other good news is that with both catalyst atmospheric hydrogenation seems to give very good yields, so no need of pressurized hydrogen. This article describs the use of reuseable, easily prepared SiO2-supported Cu catalyst for hydrogenation of unsaturated ketones. Highly-loaded catalyst promotes complete reduction to the saturated alcohol. But 8% Cu/SiO2 apparently gives good yields when reducing the titled compound, derivative of benzalacetone were the phenyl ring is replaced by a substitued naphtyl ring. Both compounds should behave similarily I guess. No isolated yields are mentionned, only high selectivities, which can be unclear towards to true efficienty of the reaction. High selectivites but low conversions can be usefull for industrials when the substarte can easily be recycled. Once again, >98% selectivites are mentionned for 5% Pd/C. It is also mentionned that adding ~5% K2CO3 to a Pd/C hydrogenation minimizes the formation of the saturated alcohol, which is a good find. Even if the catalyst can easily be prepared before introduction of the substarte, the problem is that changes in the quality of the silica can cause drastic changes in the products, especially with aliphatic unsaturated ketones. Conjugated aromatic unsaturated ketones appear more resitant to this change in chemioselectivity. But as I personally make my silica gel from soduim silicate solution and HCl, the quality varies enormously, and I don't really have means of controlling porosity, surface/gram and other caracteristics that seem to play a important role here. But the simplicity of the procedure still makes this a interesting experiment. Cu-based catalyst are said to be more selective to carbonyl reduction than double-bonds, and if reprocuble results can be obtained with home-made catalyst, this could have other applications for different compounds, and thus make cheap, available hydrogenation catalyts for the home chemist, compared to other mostly expensive ones. I'm finding this subject more and more interesting. What started as a simple weekend-occupation subject is turning into my major center of interest actually. I'm very lucky that there some interesting litterature on the subject, and incredibly helpfull members here that provided these articles as I can't access any libraries at the moment. Again, thanks a million. Synthesis of 1-(4-hydroxy-3-methoxyphenyl)but-1-en-3-one by basic crossed-aldol condensation of vanillin and acetone. Finally started this very easy reaction. I just scaled up 20x the L. R. SMITHChem. Educ. 1(3) "short" synthesis, and plan on leaving it 48h at room temp. 5g (33 mmol) of reagent-grade vanillin [Picture 1] were weighed, and dissolved in 20mL (~280 mmol) of technical acetone, giving a totally limpid solution, in a 100mL capped bottle containing a stir bar [picture 2]. 2g (50 mmol) of technical NaOH were dissolved in 20mL dH2O (10% w/v, 2.5 mol/L), and the warm solution was cooled under a stream of cold water. 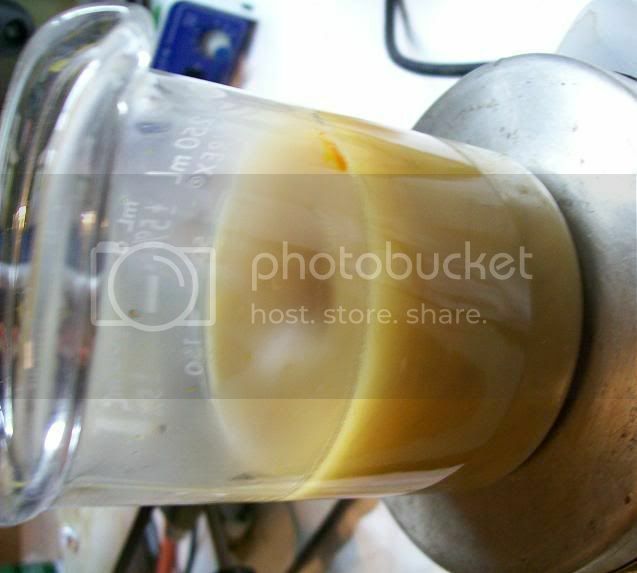 Once at room temp, the solution was slowly poored into the acetone solution with steady stirring. This immediately caused the solution to turn yellow and warm up somewhat [picture 3]. 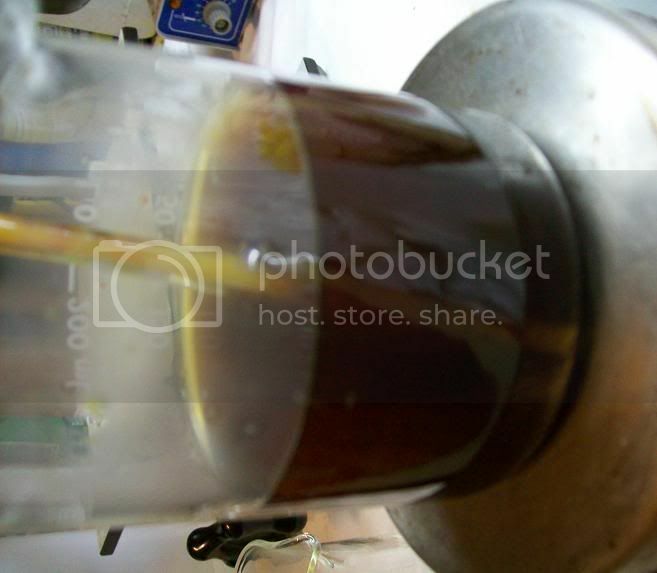 The color gradually darkened, becoming dark orange after 5min, and the bottle cooled down gently [picture 4]. This will be stirred at RT for 48h, then worked up as per the article: addition of 100mL of 3M HCl, filteration and washing of the resulting solids, recrystallization with EtOH/H2O, and caracterisation of the product. This unsaturated ketone will then be hydrogenated over 10% Pd/C to the corresponding ketone, 1-(4-hydroxy-3-methoxyphenyl)butan-3-one, or Zingerone. Hydrogenation over preformed Co2B might also be tried. 12h later, the mixture is now dark cherry red. I will post a picture tomorow as I don't have the time right now. After 48h stirring at RT [Picture 1], the dark red/black mixture was transfered to a 250mL beaker, and 100mL 10% HCl poored in with magnetic stirring. A black oil crashes out, giving a black heterogenous mixture [Picture 2]. 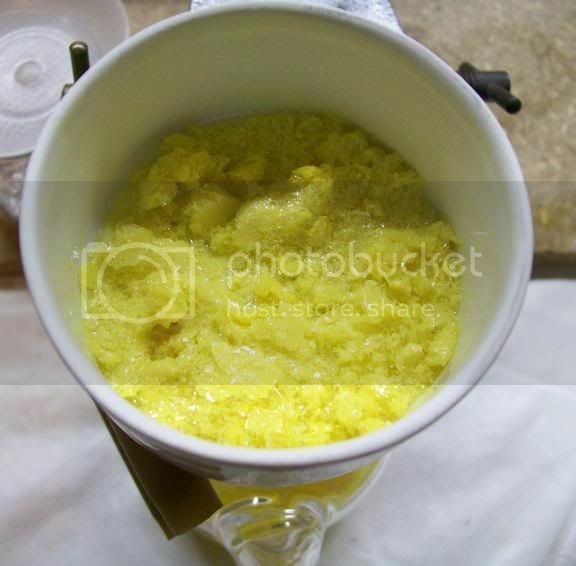 After 2min stirring, a fine yellow solid started precipitating [Picture 3]. Black droplets were still present at the bottom. After another 5min stirring , the suspension was filtered, care taken of decanting the heavy, dark granules present at the bottom of the beaker. 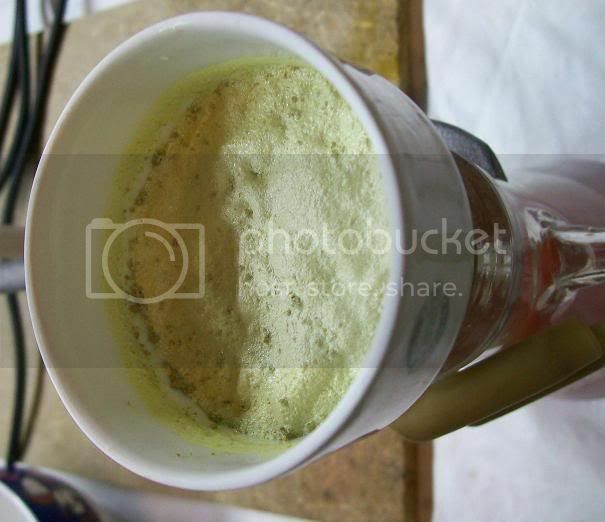 The fine suspension gave a greenish crystalline powder [Picture 4], which was washed with a little water, dried with suction on the buchner, and transfered to a small beaker. 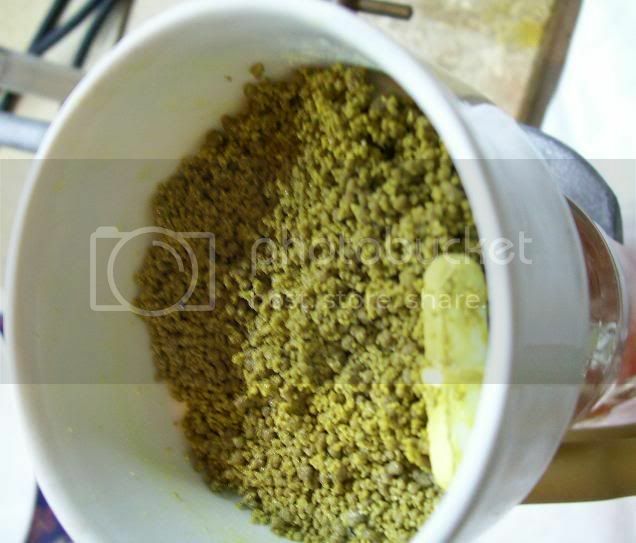 The dark crystalline granules were equally washed, filtered and dried [Picture 5]. They did not agglomerate, and were very easy to collect in a seperate beaker. The two crops were recrystallized with hot 10mL EtOH, followed by gradual addition of 5-8mL water, and left to cool. The first crop gave a clear, greenish solution, the second gave a dark brown, but limpid solution. The first crop crystallized very quickly. It was filtered, briefly washed with water, and dried on the buchner [Picture 6], giving beautifull canary-yellow crystalline flakes [Picture 7] . The second crop crysatllized much less, not enough water had been added. The formed crystals were filtered, the filtrate replaced in the beaker, and the cake sparingly washed with water and dried. 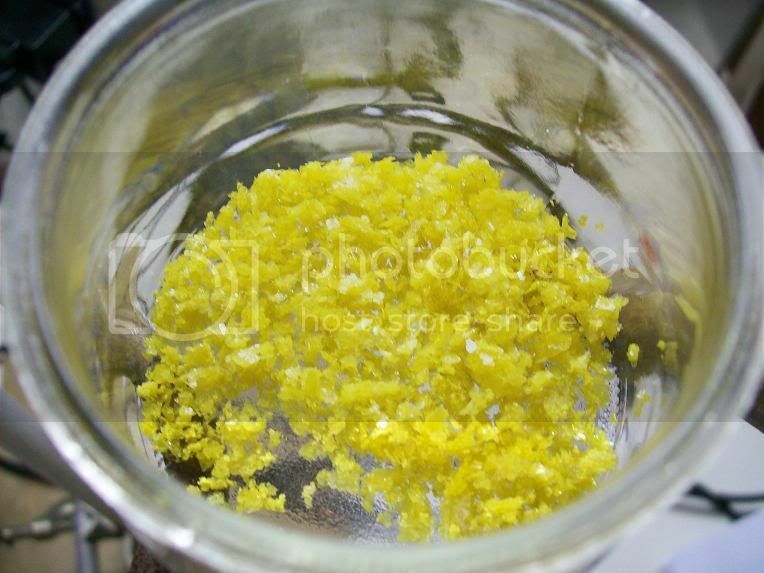 The crystals formed, although larger than the first crop, were of a more darker yellow [Picture 8]. The two crops of crystals were left to dry in the dessicator, and finally weighed exactly 2.53g each! The final weight was 5.06g (26.35 mmol), representing a yield of 79.86%. Not bad. Hydrogenation will hopefully be performed next weekend. I was wondering if someone could help me out with something regarding this synthesis of zingerone. I am currently in a beginner-ish orgo chem lab in college, and I need to propose a 3 step synthesis of a compound of some interest. As far as I can tell, the synthesis of zingerone from vanillin is only a 2 step (the vanillin and acetone with NaOH and the hydrogenation), and I'm having trouble coming up with a possible third step either at the beginning or end. I mean, I can sort of see some compounds I could possibly synthesize vanillin out of, but they seem to be unimportant things that would not be readily purchasable. I read that zingerone is produced by heating gingerol through a retro aldol reaction. Now, mind me if I say something stupefying as I do not have much practical lab experience, but would an aldol reaction of zingerone and what appears would be an aldehyde be at all feasible? If anyone could help out, I'd really appreciate it. I have a backup plan if I cannot figure something out with zingerone, but this seems more interesting. You could make the vanillin from eugenol, that's a common academic synthesis IIRC, using KMnO4. I'll have a look to see if I can't find a protocol at home. Or there some news ways of making vanillin from lignin. Maybe you could reduce the unsaturated ketone all the way to the saturated alcohol (NaBH4/CoCl2 2 steps-one pot, see the article mentionned earlier in the thread, or better LiAlH4 if they let you handle that) and then oxydize to the saturated ketone. You could try the rheosmin synthesis, making the p-hydroxybenzaldehyde, although I haven't found a practical way with the chems I can acces for now. It seems the Riemmer Tiemann formylation would essentially yield salicylaldehyde, with only small amouts of p-isomer. Good luck, please keep us posted on what you decide on doing, and how it goes. @Tinydantzler: Vanillin can also be done by formylating guiacol (2-methoxyphenol) - a cheap and readily available chemical. This can be done by the Reimer Tiemann reaction in the presence of cyclodextrin or tertiary amines (they change the regioselectivity of the reaction thus allowing for the para formylation). Other published methods include the condensation with glyoxalic acid in basic media following by the oxidation of the intermediate mandelic acid to vanillin (but these are two steps). One Japonese patent also describes the Vilsmeier-Haack formylation of guiacol using DMF/POCl3 at 120°C. This last is probably the most suitable for lab scale. Alternatively, I think Solo (here or elsewhere) came up with a 1-step procedure for benzaldehyde from phenylalanine - this might hold true for tyrosine (p-hydroxyphenylalanine) then you have the p-hydroxybenzaldehyde. From that rheosmin synthesis could be acheived in the remaining two steps. Will give crap yields of the benzaldehyde, but like I said, if yield ain't important. If however you use diazomethane some very interesting methyl ketones might result. Nicodem: does that tertiary amine trick work in general, or is this only related to vanilin? I don't remember ready about this before, IIRC the Riemmer Tiemann review (haven't got the ref on hand, but it was made available here) doesn't mention it, but I haven't got the document at hand so can't confirm this. If you've got a ref or two, I'd be delighted to give them a look. LSD25, smart idea from the tyrosine, but indeed seperating the vast amount of byproducts would be time-costly, and for minimal yields. But both products (tyrosine and S2O82-) are pretty available. I'll have a look for Solo's idea, or ask him directly if I can't find anything.